There are hits, there are mega-hits, and then there are the top ten ten million selling games of the millennium, a new list compiled by the good and helpful folks at VideoGamesBlogger. 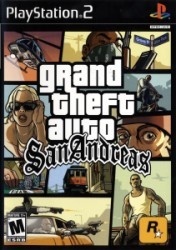 1 - Grand Theft Auto: San Andreas: 21.5 million since 2005. The growth in popularity of videogames with mainstream audiences is evident in the growing number of ten-million-sellers released in recent years, as well as the number of relatively new titles that will soon achieve the mark. Four releases, three of which haven't even been on the market for a year, are rapidly approaching the ten-million sales figure: Wii Play, which has sold 9.23 million copies since December 2006, Guitar Hero III with 9.5 million copies since October 2007, Halo 3 at 8.1 million since September 2007 and Grand Theft Auto IV, which has achieved sales of six million copies despite being released less than two months ago, in April 2008.